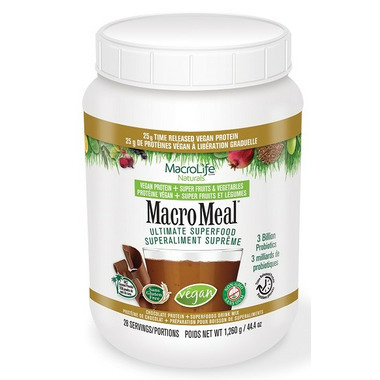 MacroLife Naturals MacroMeal Vegan Protein is scientifically formulated with an advanced blend of fast, medium, and slow digesting proteins (Pea Protein Isolate, Organic Brown Rice Concentrate, Pea Protein Concentrate), that deliver sustained energy. Feel the difference of Macro Nutrition! Vegan Protein = Protein for Conscientious Vegan and Vegetarian. that sustains energy and satisfies hunger. Nutritious Plant Based Vitamins support your body with calcium and iron to optimum health. Ingredients: Hydrolyzed Brown Rice Protein Concentrate, Hydrolyzed Pea Protein Concentrate, Hydrolyzed Pea Protein Isolate, Organic Cocoa Powder, Organic Barley Grass*, Organic Flax Seed Meal, Coconut Powder, Modified Coconut Oil (Medium Chain Triglycerides), Apple Powder, Sunflower Lecithin, Spirulina, Acerola Extract Powder, Sea Salt, Chlorella Powder, Spinach Powder, Aloe Vera Powder, Probiotic Blend (Lactobacillus Acidophilus, Lactobacilus Rhamnosus, Bifodobacterium Bifidum, Bifodobacterium Longum), Blueberry Powder, Pomegranate Powder, Beet Juice Powder, Organic Maca Root Powder, Goji Powder, Acai Extract Powder, Mangosteen Powder, Cinnamon, Alpha-Tocopherol, Stevia Extract, Natural Flavours, Protease, Amylase, Lipase, Bromelain, Papain.